Intended for use on Jeep Wrangler JK with stock 3.6L Pentastar V6 engines. 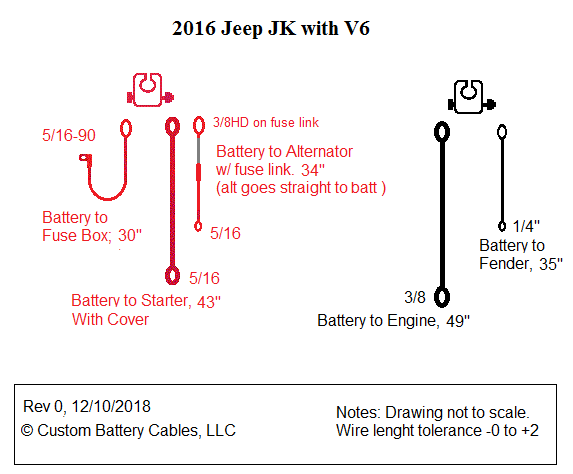 This is a new product based on stock cables from a 2016 (3.6L Pentastar) provided by a customer. I’ve been told the 3.8L EGH V6 used in the 2006-2011 is different. We have sold several kits and received positive feedback however the design is subject to change. 2 gauge positive battery cable with 4 ga fuse block lead. Starter lug cover to protect against accidental short circuits during oil changes. Beware of cheap kits that do not include a cover. 2 gauge negative battery cable with 6 gauge chassis ground. 4 gauge alternator cable with fuse link. The fuse link is a protection device like a circuit breaker. Beware of cheap kits that do not include fuse link. anti-corrosion battery washers. Batteries leak acidic fumes around the post. Use these washers to help prevent corrosion. anti-corrosion bolts (standard automotive top post only). The military terminal upgrade is standard. Do NOT purchase upgrade separately. Battery terminal covers optional. See below.